Zephyrhills 100th Anniversary: An Interview with ZHS’ 1st Principal’s Daughter - Zephyrhills, Florida 100th Anniversary! Leadership is essential to any organization. Zephyrhills High School has had a total of 31 school principals. Until the late 1950’s, the ZHS principal was considered the ‘supervising principal’ of the community . Setting the tone was Judge James Wilton Sanders who was the first Zephyrhills Principal at the very young age of 23. He went on to be elected Pasco School Superintendent at age 25; his photo and proclamation are proudly displayed at the Pioneer Museum in Dade City. Go to: http://www.fivay.org/zhs/zhs19.html to see photos and information on all of the Zephyrhills principals throughout time. You will see the principal of the Zephyrhills African American School, Bessie F. Barefield; the two longest tenured ZHS principals, Dr. Charles Henderson and Raymond B. Stewart. In the weeks to come, we hope to research/interview some other principals or their descendants and tell you more about these community leaders. Clereen and I were fortunate to interview James Sanders’ only surviving child, Johnnye Mae Sanders Entz on Saturday, January 31st. Many thanks to the Dade City Pioneer Museum who allowed us to take along the official proclamation which they possess, to photograph with Mrs. Entz. A ZHS alum, Susan Gill Holt, arranged for us to check out the proclamation from the Museum’s Little Red School House exhibit. James Sanders was a large man in stature—six foot two with a stern demeanor and the heart of an outdoorsman. He loved to hunt and fish. His daughter also related that her parents both learned their parenting skills from their many students (her mother was a teacher as well). She confessed that they had seen it all—every excuse and story known to man from their assorted pupils, so unfortunately the Sanders’ kids could not get by with much in regard to antics around the house. Mrs. Sanders told us that James Sanders was appointed judge in 1927 by the then Florida Governor Martin and went onto serve three terms as a Judge. She told us that until his death however, he was a fearless supporter of education (his true calling) and worked to consolidate the schools in central Pasco—hence Sanders was named for him. Mrs. Entz related that time does soften that ideal image we have of our parents as ‘perfect,’ but even with the experience of some 91 years, she still acknowledges that her father was a person of strong moral fiber and deep patriotism. In those days of Zephyrhills School infancy in 1910 and after, educators were trained in the seminary and religion was infused into the school curriculum. 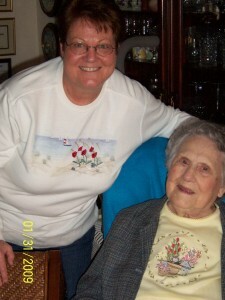 Clereen and I so enjoyed our wonderful visit with James Sander’s daughter. Two anecdotes she shared with us were particularly tender. She told us that her father was a high energy and dedicated man with a strong work ethic; thus when he was stricken with an appendicitis attack and had to have an operation, they were grateful for Marjorie Kinnan Rawling’s new book, The Yearling in 1938. She said Mr. Sanders was so engrossed in reading about the animals and rural Florida, that they were able to keep him in bed to recuperate from the appendectomy. The other story she shared with keen enthusiasm was in regard to the ‘Judge’ Sanders, (after retiring as ZHS Principal). Typically he went home for lunch each day from his Judge’s office in Dade City in the 1920’s-30’s. She said, funny thing—there weren’t any restaurants in Dade City back then. James always brought guests home for lunch, and the family was never quite sure who would adorn their dining room table. How did those wonderful women do it back then? They would just set an extra plate at the table for whatever guests he brought along and enjoy the lively and interesting conversation. His daughter particularly related a time when her mother had doled out the last pieces of scrumptious fruit cake for desert and when the guest asked for a second piece, she graciously gave up her own, unbeknownst to anyone but her daughter who noticed the selfless act of hospitality. This first principal of ZHS was undoubtedly a wonderful family man who had tremendous community and people skills. He knew the students and their families and opened the very first school in Zephyrhills. He also had an impact upon Pasco County. His legacy lives on at ZHS. James Wilton Sanders was born September 7, 1887 in Hawthorne, Alachua County, Florida, son of Zedoo Munford and Carolyn (Dawson) Sanders. His father born about 1850, died December 8, 1916, was a farmer and cattleman. James Wilton Sanders has three sisters and four brothers who survived him: Mrs. J.L. Carter of Fairbanks, Florida; Mrs. J.E. Byrd and Mrs. John Touchton of Jacksonville, Florida; Mr. A.P. Sanders of Fairbanks, Florida; Mr. H.M. Sanders of Harrisburg, Pennsylvania; Mr. G.A. Sanders of Leesburg, Florida and Mr. D.A. Sanders of Eugene, Oregon. James Wilton Sanders attended the public schools of Orange Lane and later went to Godwin Seminary. Later he became a student at Florida Seminary (now connected with the University of Florida) where he prepared himself for teaching. He began active work in his profession in 1906 as a teacher in Alachua County. In 1908 and 1909 he was Assistant Principal at Florida Central Normal Institute then situated in Dade City, Florida. He taught in Levy, Marion, Sumter and Pasco Counties in the years that ensued and performed a work of value in his profession. He had positions as principal of schools at Linden and Davenport as well as Zephyrhills High School. In 1912, he was elected Superintendent of Pasco County Schools, an office that he held until 1920 when he resumed his teaching activities as Principal of Dade City Grammar School. In 1926 he left the teaching profession and turned his attention to business and to other matters that interested him in the sphere of public life. Real Estate and general merchandising activities constituted his major commercial undertakings during this period. In 1927, Governor Martin appointed him to the County Judgeship left vacant for the remainder of an unexpired term and until 1935, Judge Sanders served in that capacity. In September 1935, he was forced by the condition of his health to retire from his active endeavors. He purchased a grove in Denham where he devoted himself to managing the citrus fruit production business be established there. Judge Sanders married Essie Burkett on April 11, 1909. The union was blessed with the following children: Carolyn Elizabeth, Alberta, Johnnye Mae, Christine, Anna Claire, James Wilton Jr., and James. Judge Sanders died November 25, 1938, in Tampa, Florida. By Madonna Jervis Wise and Clereen Morrill Brunty of the 100th Anniversary Committee, ZHS. Article originally appeared in the Zephyrhills News on February 12, 2009. What a nice article about my Aunt Johnnye. All the Sanders children were incredible people, my Grandmother (Alberta), was the sweetest person, and the perfect Grandma. I miss her so, she would love this story, she was very close to Aunt Johnnye. Do you have a group or business that wants to adopt one of the many events planned? Do you want to be a part of the biggest and best Founder's Day Zephyrhills has ever seen? We need your help to make this truly memorable. These are just a few of the over 40 sponsors of Zephyrhills 100th Anniversary projects and events. Click here for a more complete list of sponsors. Win a FREE copy of Images of America: Zephyrhills! Images of America: Zephyrhills Historical Photo Book Published! Zephyrhills, Florida 100th Anniversary! powered by WordPress. Grey Dove theme by Nyutech.